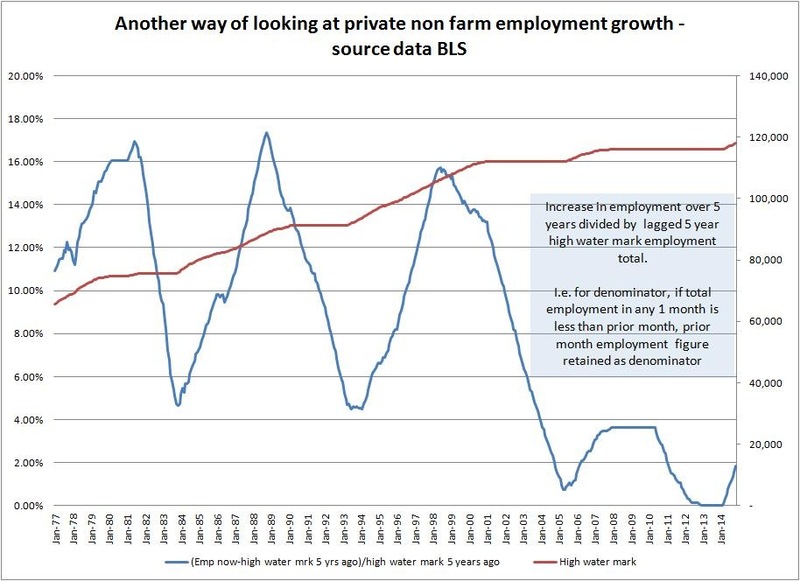 A number of commentators, analysts and economists have correctly (IMO) ascertained that what we see as slow growth is certainly not sub par, relative to what the frame is capable of producing. 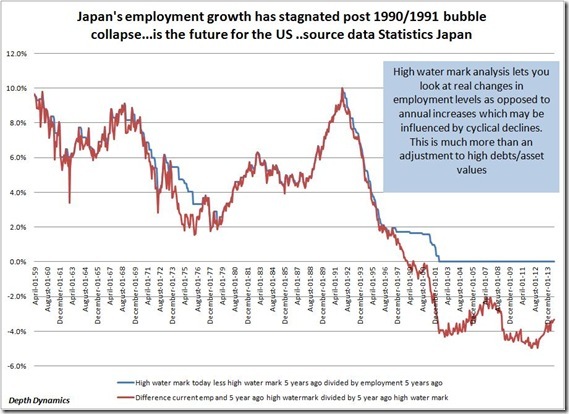 Others see only the impact of debt or the reverberations of the crisis itself (hysteresis) and believe that we will eventually recover to pre crisis growth levels. Some believe that a lack of viable investment projects have forced people to accumulate cash and other assets from “excess savings”, and that is why growth has been slowing; and all we need do, apparently, is to reduce interest rates to a level (-ve IRs) that would create the necessary differential return to encourage people to spend their accumulated non spent savings, hoping one supposes to re-establish viable returns – personally I think China may already be proving the risks of this type of strategy. Here there does not appear to be a growth supply problem, just a required rate of return problem and hence a supply of available “capital” waiting for an appropriate rate of return: this is an ex ante issue and perhaps when I get time to get down to it I will address the issue of –ve interest rates in a competitive capitalist economy; it may well imply a different socially driven allocation of capital and hence a totally different capital valuation and allocation paradigm. A subset of this viewpoint believes that public sector borrowing to finance investment projects will help ease the lack of investment due to private sector inhibition and re-establish potential growth trends. But where is this going and is the differential capacity and debt something that can be safely absorbed, or are we just deferring the reckoning? Others feel that consumers are saving too much and that what we need is not just low or negative interest rates but a rise in inflation, or rather a rise in inflation expectations, to increase the attraction of spending accumulated excess savings (savings neither consumed nor invested in productive capacity). In other words they feel we have a liquidity trap. And why not? 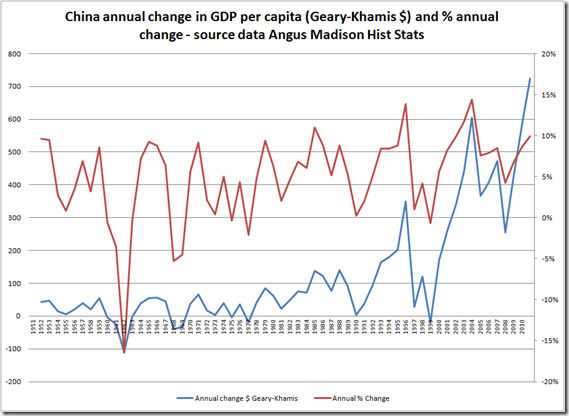 The world is awash with money and asset values are at historical highs relative to GDP. This is a similar idea to the lower interest rates to encourage investment but different in the sense that it assumes people are deferring consumption and that it is the imbalance between consumption now and in the future that is causing lower growth. Others believe that the crisis was caused by a savings glut, that emanated from those exporting fast growing emerging and developing economies. It was this supposed glut that led consumers to borrow, debt to rise and a crisis to unfold. I have addressed this in prior posts. Others point to increasing income inequality, aging and declining populations, declining productivity growth rates, all reasons I would term fundamental frame issues. These tend to be supported by a fair amount of data including weaker capital expenditure, higher profits and share buybacks. I tend to align more with these arguments and believe that every effort that has attempted to raise growth has been done in ignorance of this particular reality: all we have done is create less sustainable ever increasing levels of debt and asset prices even more at odds with future growth potential. We have tried to push something higher that should have been moving along at a slower pace. But income inequality may also have been exacerbated by the rise of developing economies as places to produce lower labour cost consumer goods. Likewise would debt have expanded so fast if interest rates had not been dropped, in western developed economies, to combat lower growth and the financial shocks that seemed to accompany this higher risk monetary policy? Higher income growth and reduced income inequalities tied with higher interest rates would most likely have provided a different outcome. I have previously placed a large part of the blame for the financial crisis on lax monetary policy that created the conditions for excess asset focussed money supply growth and increased consumer borrowing. I discuss this dynamic in my posts on interest/asset/debt chokeholds and most lately in a couple of posts on the Savings Glut. But these were essentially accommodations that exacerbated the impact of slowing growth and a weakening frame. Would we have had a financial crisis that almost melted down the world’s financial system if we had not tried to squeeze the orange? I doubt we would have had one of the magnitude we experienced. 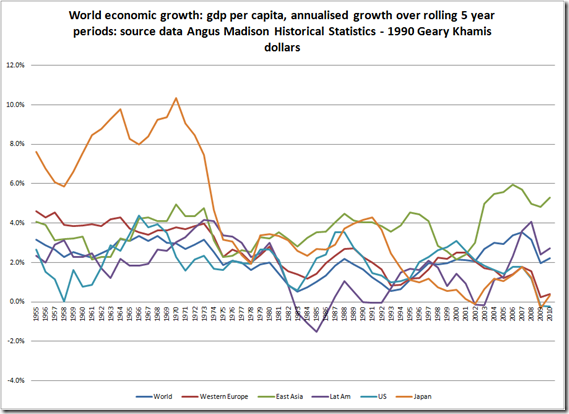 The truth is that growth rates have been slowing in many developed economies for some time, possibly circa the mid 1990s, due to a number of factors: demographics; Japan; increasing inequality of income distribution; slowdown of total factor productivity. 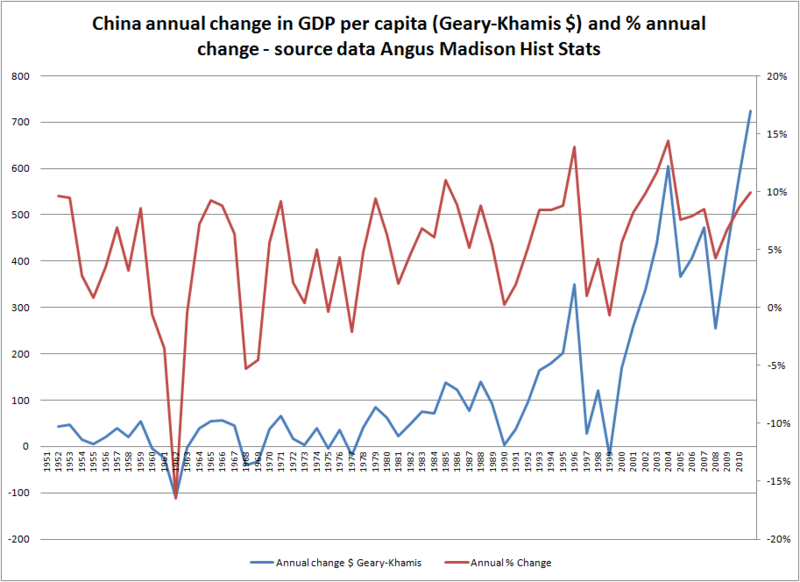 These trends however have been masked by an asset price and personal consumption expenditure boom that both raised demand temporarily in western developed economies and accelerated growth in developing economies. 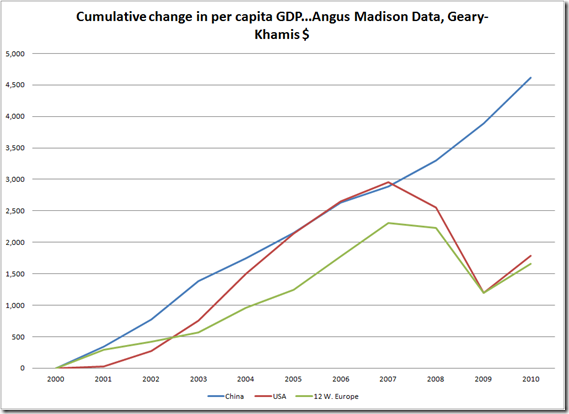 Overall during the noughties global growth accelerated, that is up to 2008. 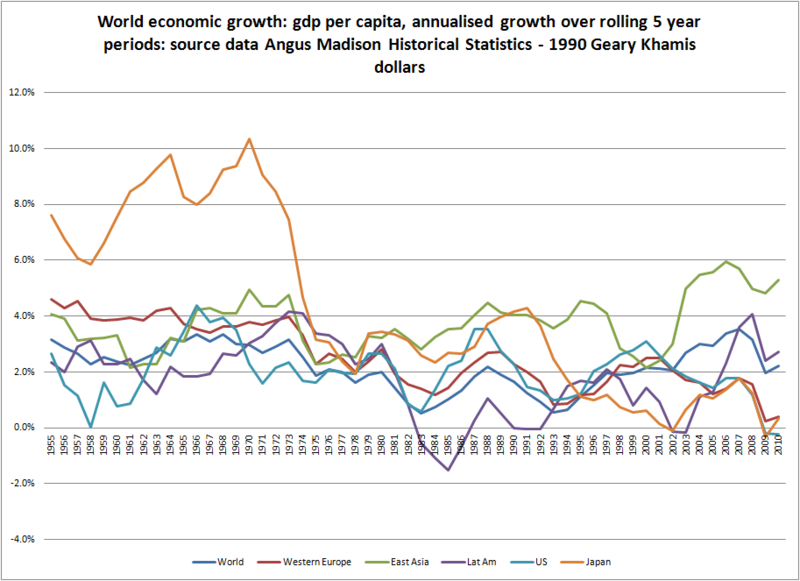 The problem was that this acceleration made a number of these economies over dependent on this rather short burst of growth. 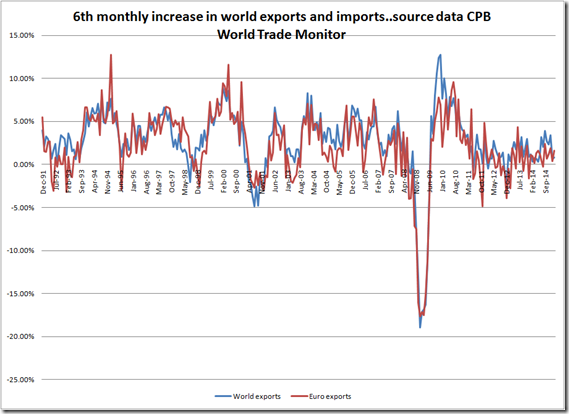 Underlying growth rates post 2008 have slowed considerably and this is mirrored on slower growth in world trade and a further widening between the growth rate of debt and GDP in developing economies. It also made the world economy more highly dependent on an eventual rebalancing of growth in developing economies towards domestic consumption and away from exports and gross fixed capital investment. The time frame for this rebalancing is part of today’s problem: developing economies are not going to be rebalancing within the necessary time frame and look unable to bear the high levels of debt that have accumulated pending this transition. So the developed/developing economy interaction both masked the slowing of growth and raised the risks of a shock to growth via higher levels of debt and realignment of economic structures in developing and developed economies. In truth we have had a financial boom that has curved along the declining interest rate and increasing money supply axes without adjusting for the slower growth of future cash flows associated with a weaker growth frame. The short term risks to growth have likewise heightened as the race to bridge the gap between developing present and developing future look to be failing (i.e. China). 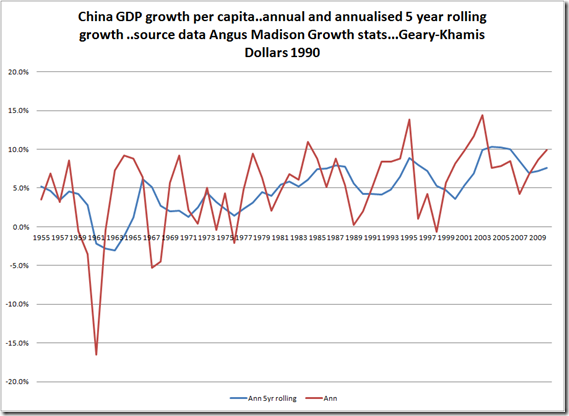 The wild markets of the late 1990s were the first signs of a mismatch between growth and the monetary and economic policy focussed on juicing growth friendly environments. The noughties carried on and exacerbated this trend, creating asset bubbles in residential property in key markets and increasingly higher levels of consumer debt relative to weaker income growth fundamentals. 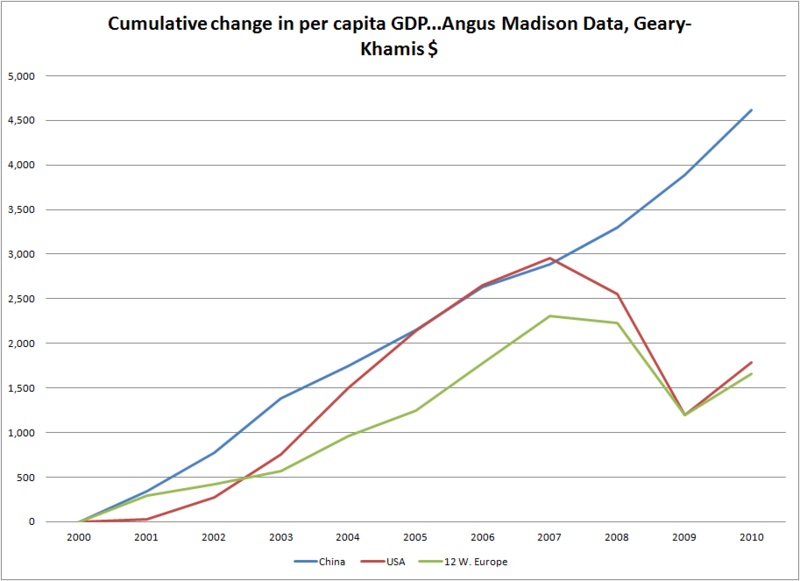 This has carried on in key developing economies, post crisis, notably China. 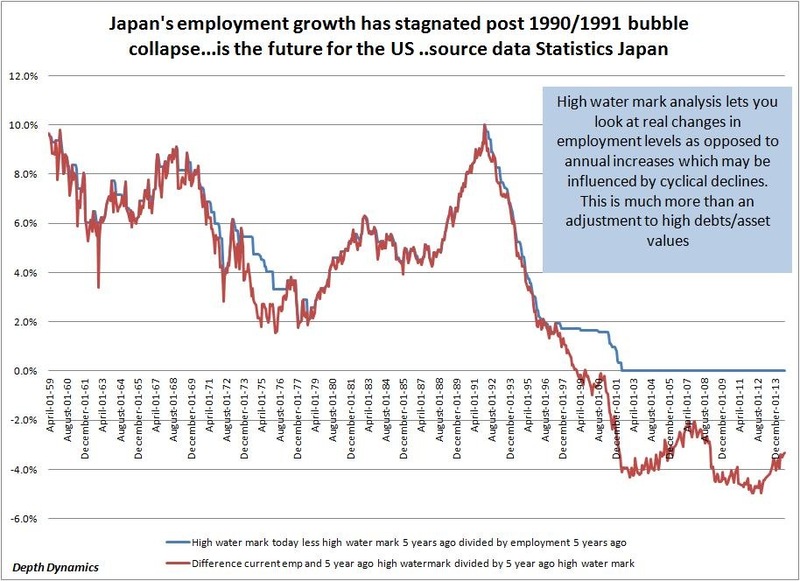 So we have a clear pattern: Japan, just when the frame could least accommodate a rise in debt, debt was rising; the US and other developed economies likewise from the mid 1990s to 2007 (and a resumption of these trends recently) and post crisis in key developing economies. 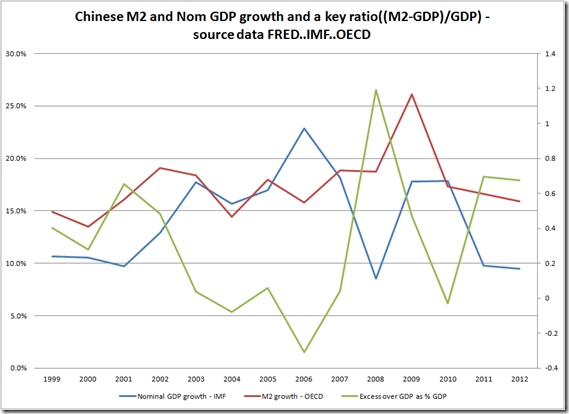 As stated, while global growth accelerated during the 2002 to 2007 period, I believe underlying long term growth potential (developed especially) had ticked down a step further in these years. The interaction with “slowing growth increasing private debt developed economies” and “higher growth developing economies, with accumulating debt” probably further exacerbated the divergence even further. 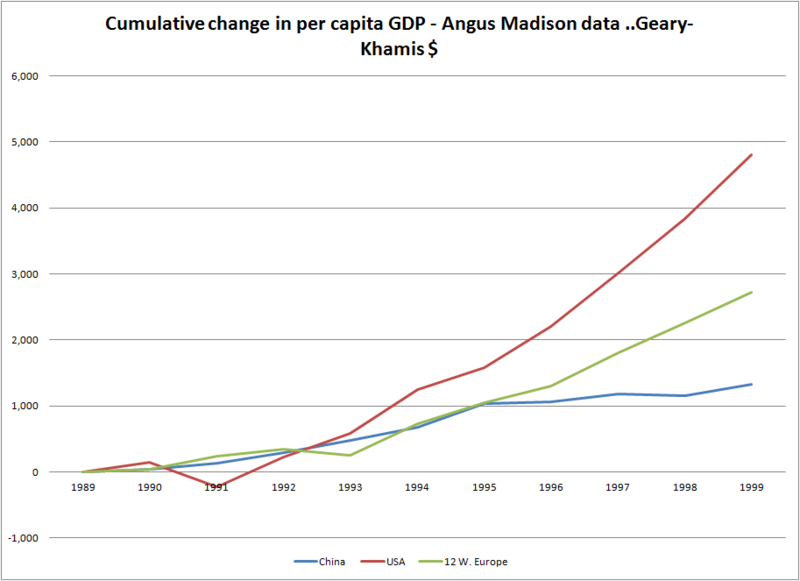 It is plausible that these developing economies, during the noughties especially, were growing at a higher rate than they would otherwise have done; that is, if not for the surge in private developing market debt that supported consumption and the shift towards situating global supply chains in these economies. 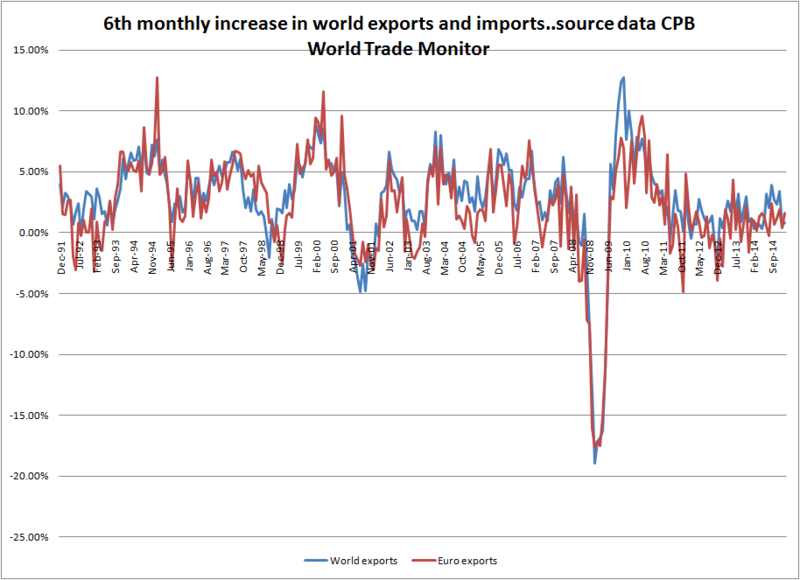 World trade (as many have pointed out) has grown at a much slower pace post 2008 than it had been in the post war period. 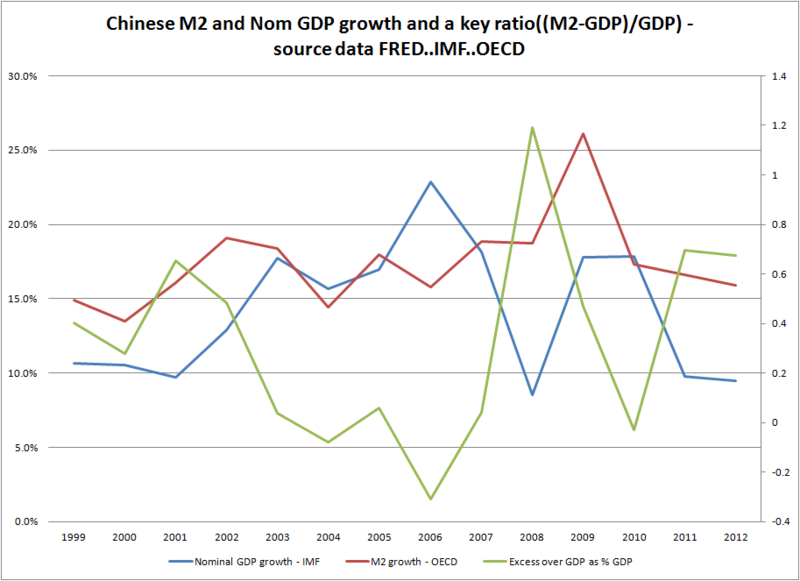 And also noteworthy is a comparison of Chinese GDP growth and M2 money supply growth (OECD and IMF data sourced via FRED). 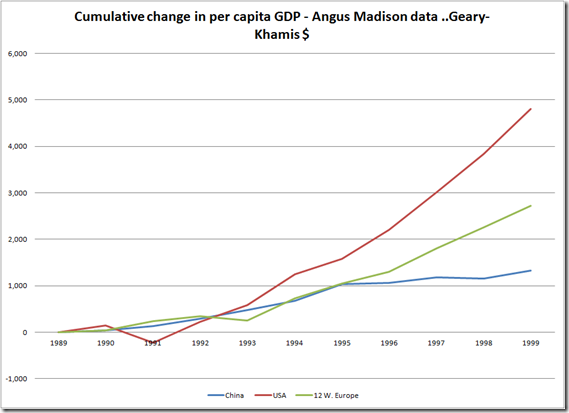 A – A declining frame in key developed economies: population growth. B- Changes in the natural growth rate of the frame given A: productivity growth and technological innovation. C – Impairments in the frame: increasing income and wealth inequality. D – Accommodations attempting to offset A,B and C: lower interest rates and higher money supply growth that has boosted debt amidst a slower growth frame and that have led to asset price shocks impacting both the financial system and the frame itself. E – Inter temporal and structural imbalances: the maturing of developed economy growth and the accelerated growth of developing economies and the over dependence on the convergence of the two within an acceptable time frame. 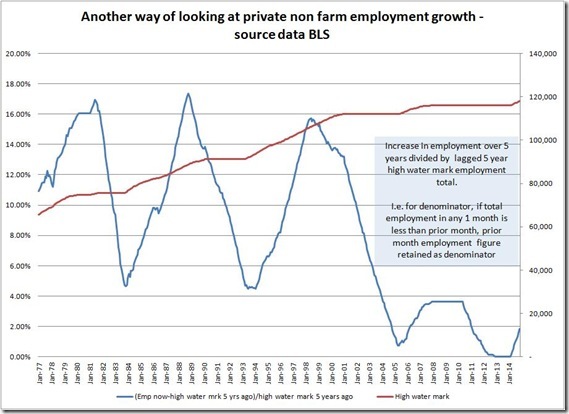 F- Secondary impacts on C and B due to offshoring to developing markets. G – Further accommodations: a secondary stage in the global debt cycle as developing markets looked to offset the lack of demand from developed markets post the financial crisis. 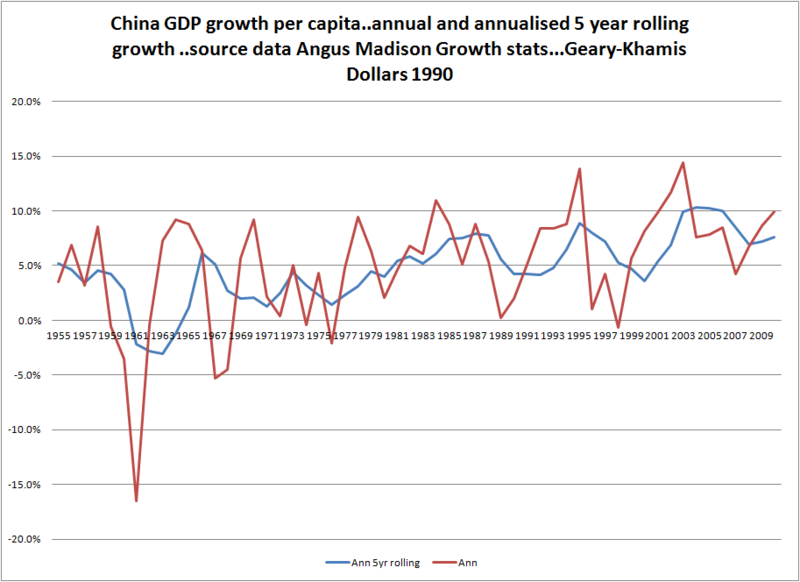 Economic growth was slowing naturally, but we ignored this, have tried to accommodate this and have done little more than increase the overall fragility of the financial and economic system, as well as accelerated an imbalanced development of developing markets that look to be entering their own financial crisis mode (essentially China). This entry was posted in Capitalism in Crisis, Consumer debt, Demographics, Economics, Excess consumption dynamics, Savings Glut, Secular stagnation, World trade and dynamics by Depthdynamics. Bookmark the permalink.